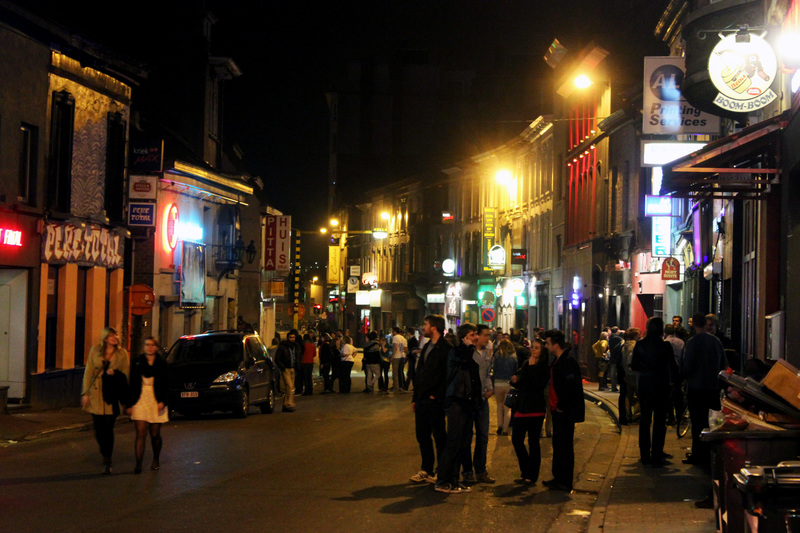 Ghent has a massive student population and culture. 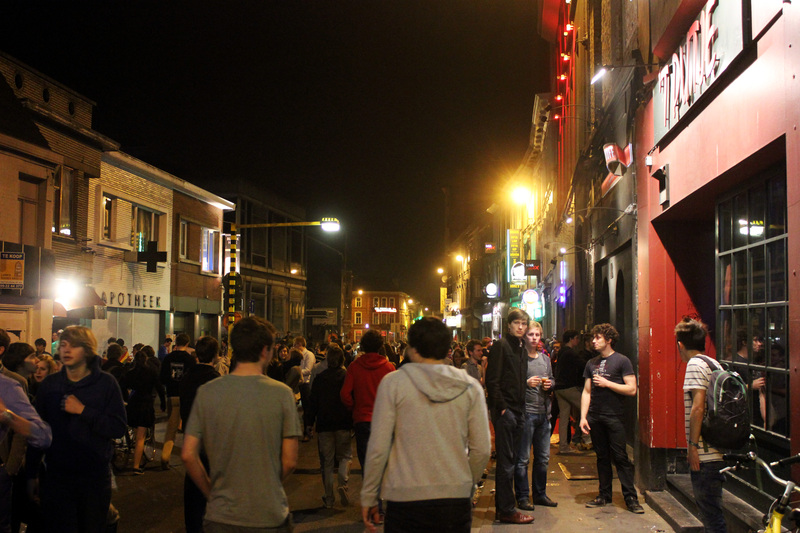 More than 65,000 students– erm… “study” in Ghent, and the Overpoortstraat is their party headquarters. Any given weeknight, loads of students can be seen at any of the 32 (!) student bars on this small street. The bars vary in their themes, styles, and music, ranging from Latin to Metal to House, Dubstep, Hip-Hop, and more. 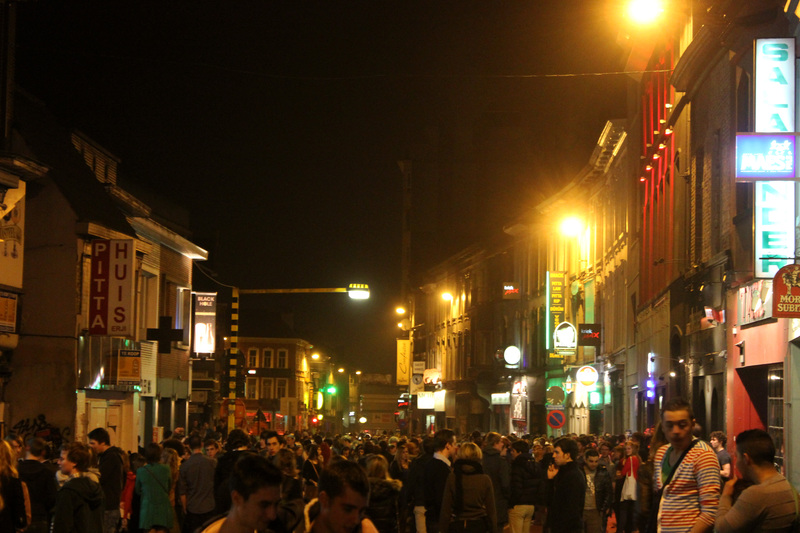 The biggest party night is Thursday, for during the weekends, the students and their hangovers head back home, a common practice in many Belgian university towns. This is not a classy environment in the least. Urine and pilsner line the streets and empty beer cans are more common than concrete or cobblestone. If the youngsters aren’t busy vomiting, then they are drinking, stumbling, and shouting on the streets. But it’s really not as bad as it sounds. In fact, it’s great. This place definitely benefits from Ghent’s extremely laid-back culture, and it is truly a joy to be here, whether to observe or partake in the madness. The night really doesn’t begin until around midnight or 1 a.m., and the party ends when the sun comes up. One thing is certain: Ghent’s student population loves to get rowdy. Just above Overpoortstraat is Sint-Pietersplein (St. Peter’s Square). Located nearby a handful of academic facilities, it is another frequent gathering spot for students, especially when there is a festival or event going on. Every March is the Halfvastenfoor, during which the square turns into a full-fledged carnival, complete with rides, games, and cotton candy (and even escargot). Of course, it wouldn’t be Belgium if they didn’t serve beer as well. This entry was posted in Belgium, Ghent and tagged belgium, carnival, europe, gent, ghent, photography, travel by Babak Haghighi. Bookmark the permalink. If they had a parade with floats and people throwing beads it might get confused with mardi gras in new orleans… except that party goes on for days. I think I’ll pass on either place. I like my parties a bit more subdued. Great pics though! What a colorful place. Thanks for sharing.